1. Conduct competitive tests to identify students who have a scientific bent of mind. 2. Provide mentors for winning students to carry forward their science education at higher levels. 3. Organise exposure visits for the winners to various R&D institutions in the country. 4. Identify successful students at the state and national levels and felicitate them with prizes and certificates. 5. Create interest among students in pure science. 6. Educate schoolchildren about India’s contributions to the world of science and technology, from tradition to modern. 6. Provide hands-on training to students through workshops and other events. 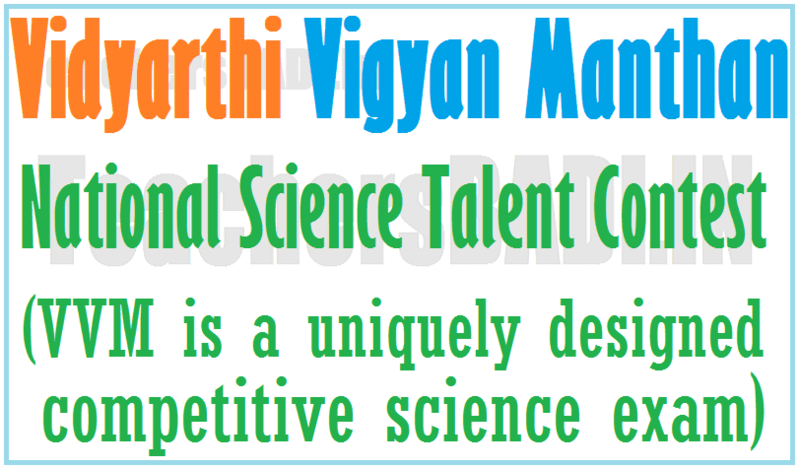 Vidyarthi Vigyan Manthan (WM) Is a national program jointly organized by Vijnana Bharati, NCERT and Vigyan Rasa, for educating and popuranzing saence among the school students of 6th to 11th standard. The main oteettve of the program is to identify keen knowledge seekers in science and then nurture them for higher level of science education. WM is a multiple level process in which each student will pass through such testing procedures as objective type question answering, Comprehensive writing. project proposal writing. group discussion, role play. practical examination & oral viva. Students in classes VI to Xt of the CBSE. ICSE & State boards are eligible to appear for this examination. 1. School Level Examination (Prathama and Dwitiya). 2. State Level Camp: Top 20 students from each class will be selected i.e total of 120 students will be selected at the state level. Selected students will be invited for one/two day state level camp. The camp will consist of hands on training, student-scientific transaction and the next stage including group activities, debate competition, role play etc., based on the performance ranking the students were state level and top three students from each class will be declared as a state winner. Out of the top three students from each state, the top two students from each class, i.e., total 12 students from each state, will be invited to a two-day national-level camp. These students will go through the next stage of the evaluation process, which comprises presentations, viva, and assessment of leadership quality. Based on their performance, the top three students from each class will be declared as National-level Winners of VVM for the year 2016 (Himalayans). Students can take examinations either in English/Hindi or in their own mother tongue. Exams will be conducted at various centres across India. Schools that can enroll more than 50 students will be designated as Examination center. School: Only government and Government aided school can register their students with 50% concession(Rs.50/- per stundets) only of school for minimum of 50 students. for other schools, they can register with Rs.100/- per students. All winners at the state and national levels receive a monthly newsletter ‘Dream 2047’ of Vigyan Prasar. The newsletter carries information and articles on the recent developments in science and technology. National-level winners will be felicitated by the Honourable President of India. #ViBha/Vijnana Bharati : Vijnana Bharati is a national movement in the field of Science & Technology working throughout the country having the largest network of organizations and individuals. Vijnana Bharati has received the prestigious Jawaharlal Nehru Prize from Prime Minister of India in 2006 & National Award for outstanding contributions in Science Communication in 2007 from Union Ministry of Science & Technology. Around 6000 eminent scientists & technocrats as members and hundreds of youngsters are working as volunteers, on the platform of Vijnana Bharati, to propagate science and its applications among students and general public. Vijnana Bharati is headed by Dr. Anil Kakodkar and Dr. G. Madhavan Nair as Patrons along with Dr. Vijay Bhatkar, Chairman, Board of Governors, and IIT Delhi as the President. 'World's largest Science Talent Contest' is jointly being conducted by Vidyarthi Vigyan Mandhan (VVM), NCERT & Vibha in India for the students class VI to XI standards on 25th November, 2018. Is there any preparatory training available for state level camp?